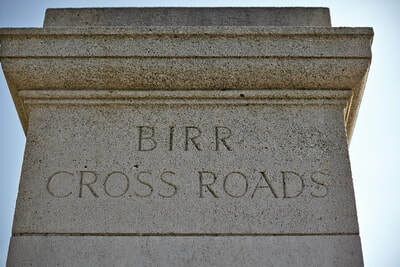 Birr Cross Roads Cemetery is located 3 Km east of Ieper town centre, on the Meenseweg (N8), connecting Ieper to Menen. 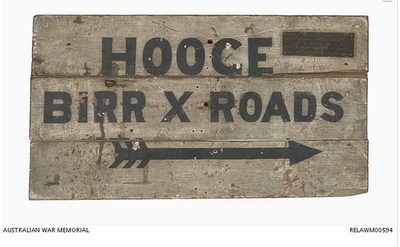 From Ieper town centre the Meenseweg is located via Torhoutstraat and right onto Basculestraat. Basculestraat ends at a main crossroads, directly over which begins the Meenseweg. 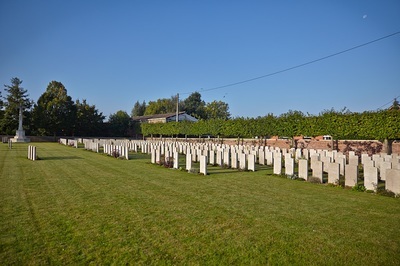 This cemetery contains graves in which more than one soldier is buried and on which more than one headstone is erected. 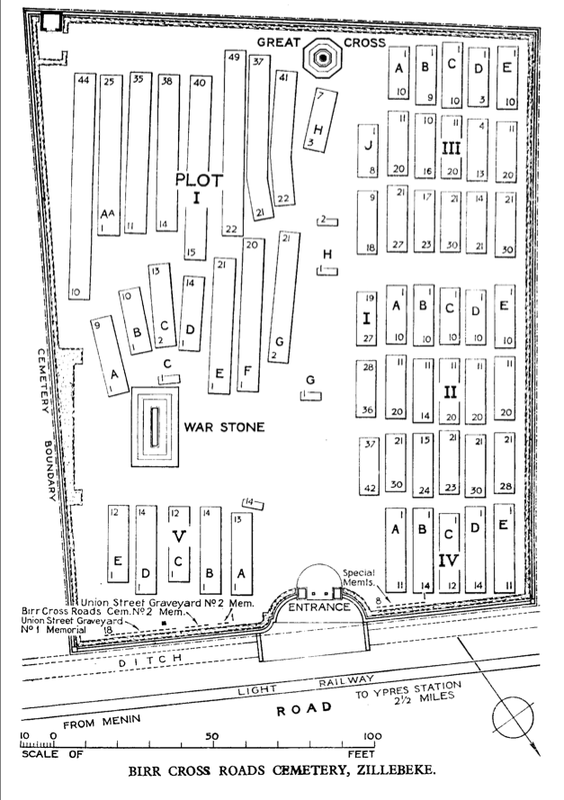 As each of these graves has a single grave number it follows that the numbering of a grave given in the register will in some cases not correspond with the number of the headstone as determined by counting from the beginning of the Row. Visitors should therefore examine the whole Row if they do not at once find the grave in which they are interested. 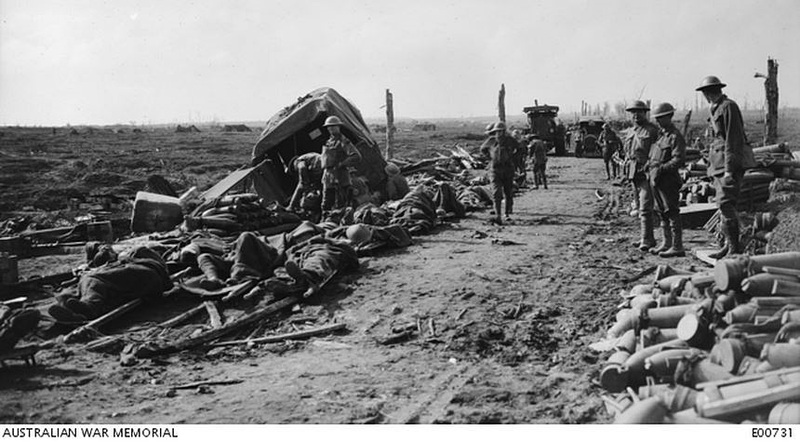 The village and the greater part of the commune of Zillebeke were within the Allied lines until taken by the Germans at the end of April 1918. The village was recovered by the II Corps on 8 September 1918. 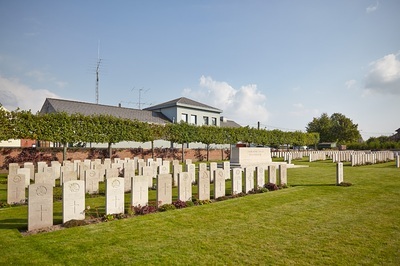 BELLEWAARDE RIDGE MILITARY CEMETERY, ZONNEBEKE, was a little way North-East of Bellewaarde Lake, almost on the top of the low hill which rises northwards from the Menin Road between Hooge and Clapham Junction. 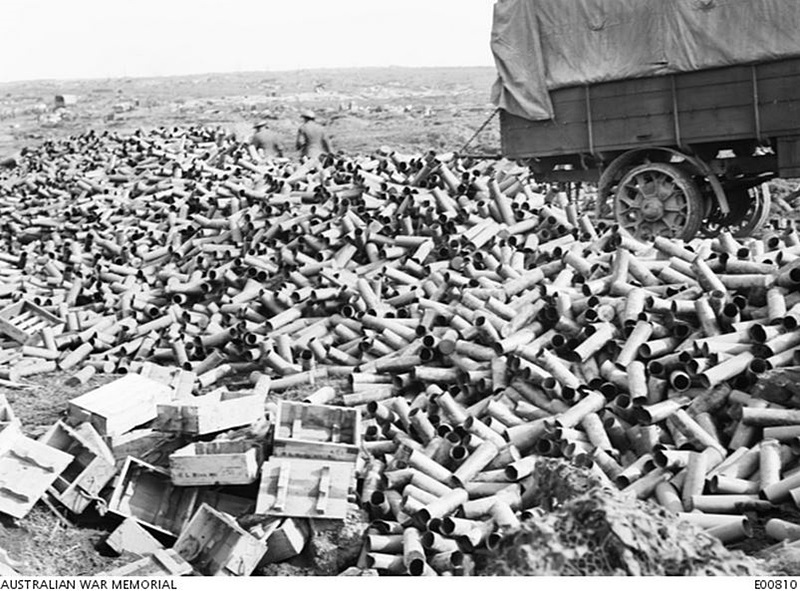 It contained the graves of 17 soldiers from Australia, and eleven from the United Kingdom, who fell in September and October, 1917. 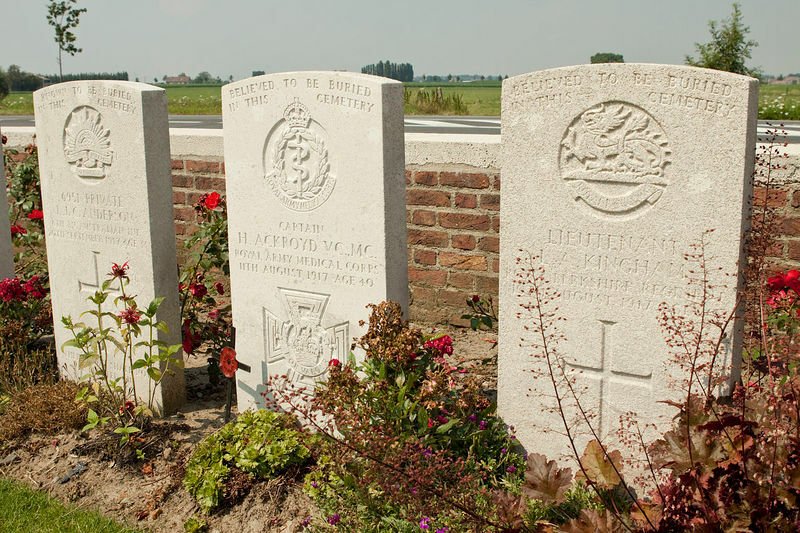 The Battle of Bellewaarde Ridge was fought on the 24th-25th May, 1915; the Attacks on Bellewaarde were delivered, unsuccessfully, in June and September, 1915; and the Ridge, taken in July, 1917, and given up in April, 1918, was finally retaken by the 9th (Scottish) Division on the 28th September, 1918. 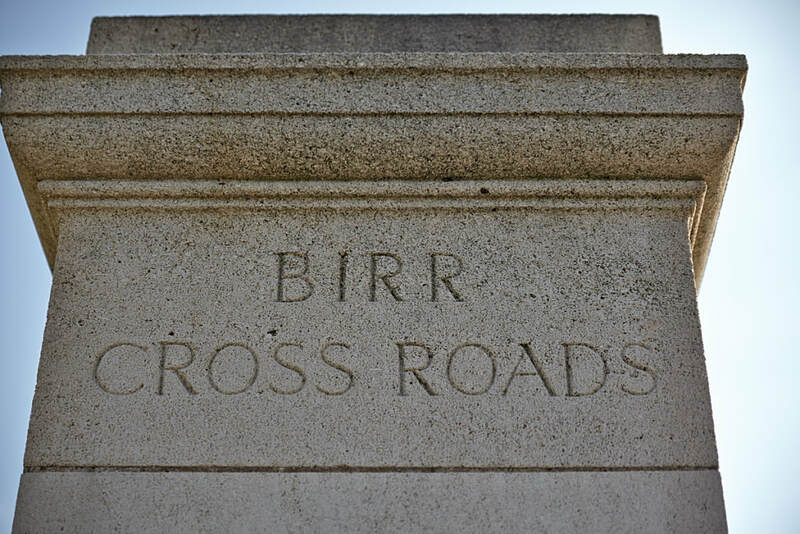 BIRR CROSS ROADS CEMETERY No.2, seventy-five metres South of No.1 (the present cemetery), contained the graves of 18 soldiers from the United Kingdom who fell in July and August, 1917. 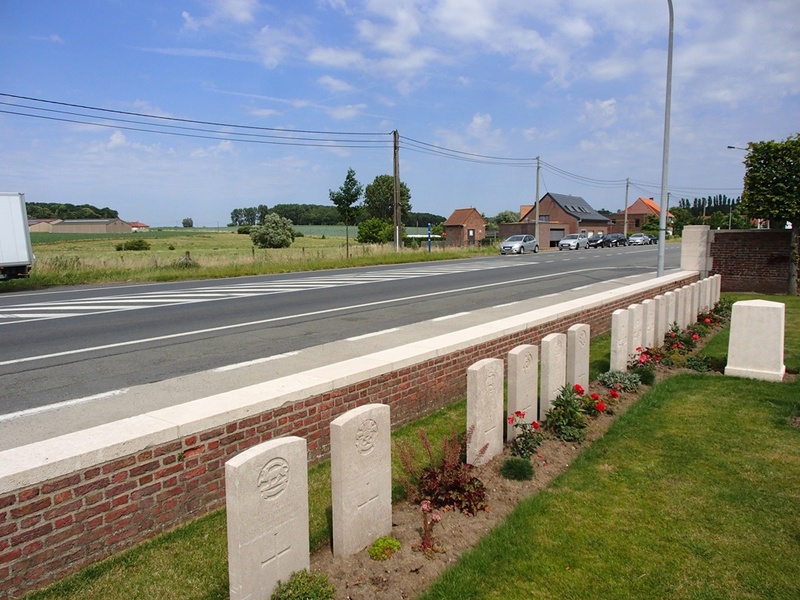 UNION STREET GRAVEYARDS No.1 and No.2, ZILLEBEKE, were due North of Zillebeke village, between Gordon House and Hell Fire Corner. 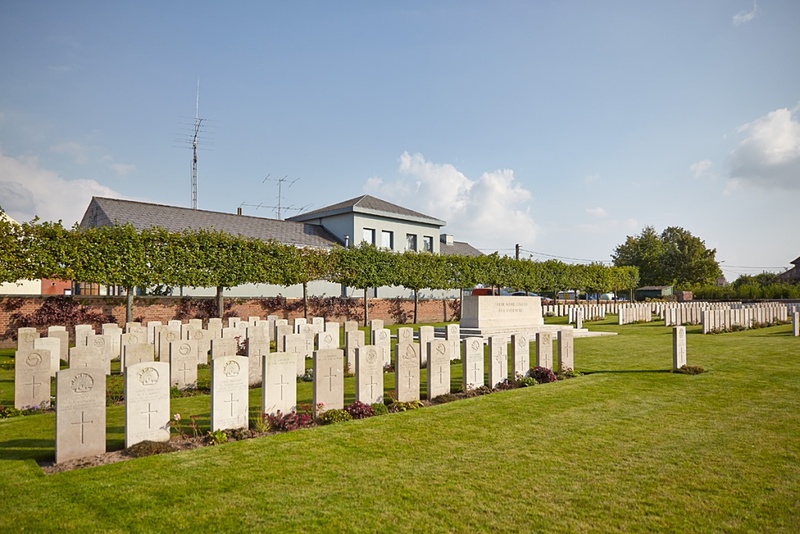 They contained the graves of 19 soldiers from the United Kingdom who fell in August and September, 1915. 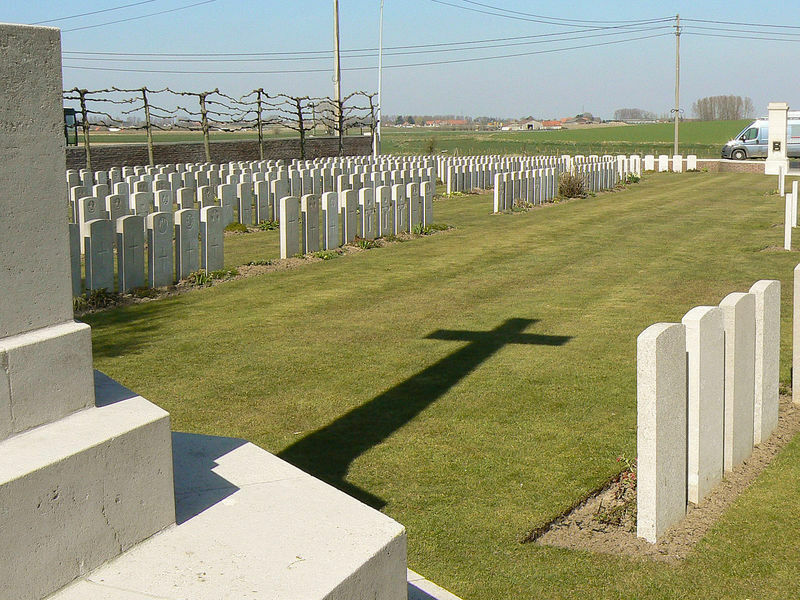 There are now 833 Commonwealth servicemen of the First World War buried or commemorated in this cemetery. 333 of the burials are unidentified, but there are special memorials to nine casualties known or believed to be buried among them. 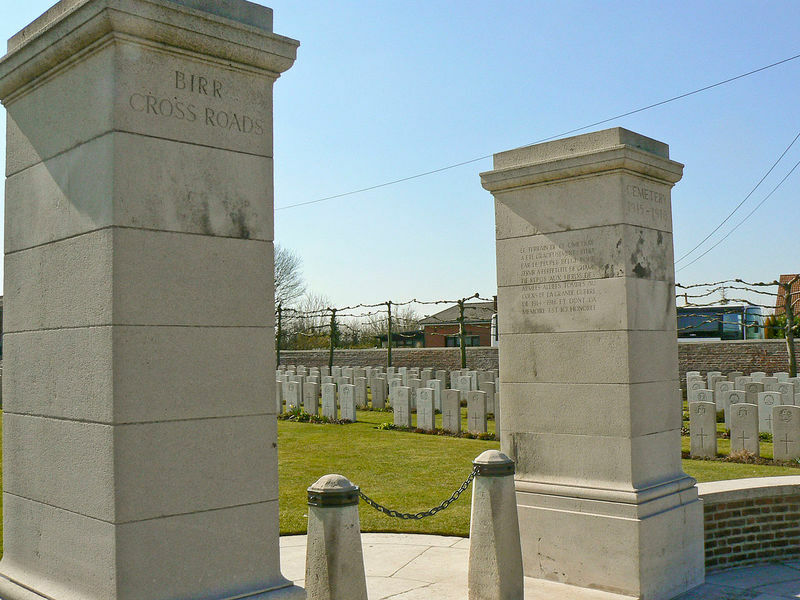 Other special memorials commemorate 18 casualties buried in Birr Cross Roads Cemetery No.2 and the Union Street Graveyards, whose graves were destroyed by shell fire, and one Belgian interpreter whose grave cannot now be found. Royal Army Medical Corps, attd 6th Bn. Royal Berkshire Regiment, 11th August 1917, aged 40. Son of Edward Ackroyd, of Southport; husband of Mabel R. Ackroyd, of Link Lodge, Malvern Link. Sp. Mem. 7. 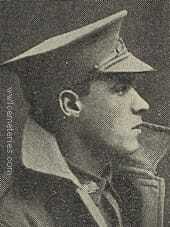 ​Citation: An extract from "The London Gazette," dated 4th Sept., 1917, reads as follows:- "For most conspicuous bravery. During recent operations Capt. 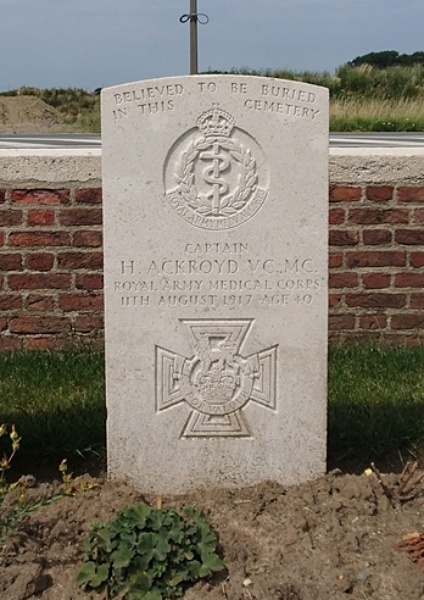 Ackroyd displayed the greatest gallantry and devotion to duty. Utterly regardless of danger, he worked continuously for many hours up and down and in front of the line tending the wounded and saving the lives of officers and men. In so doing he had to move across the open under heavy machine-gun, rifle and shell fire. He carried a wounded officer to a place of safety under very heavy fire. On another occasion he went some way in front of our advanced line and brought in a wounded man under continuous sniping and machine-gun fire. His heroism was the means of saving many lives, and provided a magnificent example of courage, cheerfulness, and determination to the fighting men in whose midst he was carrying out his splendid work. This gallant officer has since been killed in action." Son of John and Emma Britten. Born at Bega, New South Wales. 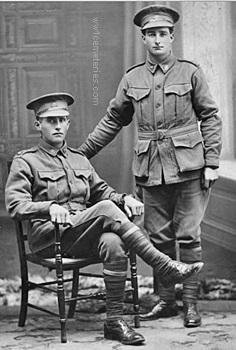 4128 Private (Pte) James Augustine Hanscombe (left) and his best mate, 4068 Pte Joseph Britten, 17th Battalion. Pte Hanscombe was later awarded the Military Medal (MM) for attempting to rescue Pte Britten, who was killed in action. Both farmers of Bega NSW, they embarked with the 10th Reinforcements on 8 March 1916. They transferred to the 5th Divisional Ammunition Column (5 DAC). Driver (Dvr) Britten's service number changed to 4068A; he also served with the 15th Field Artillery Brigade before returning to the 5 DAC. 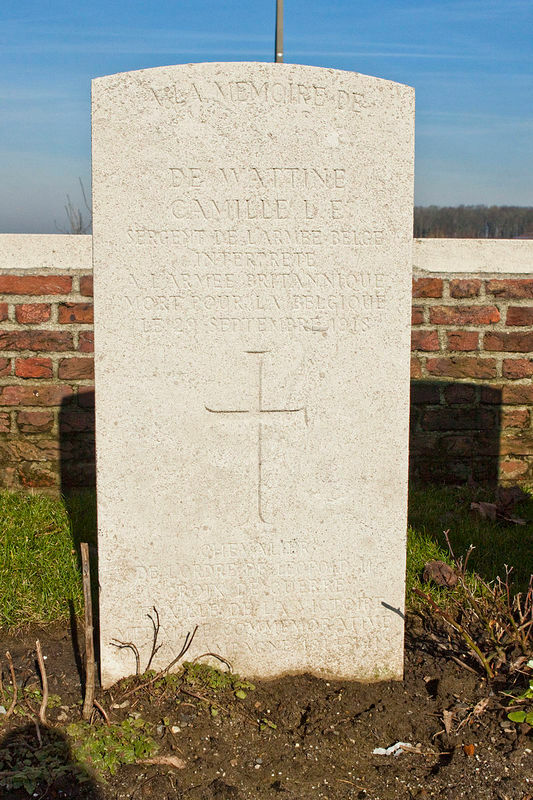 He was killed in action on 6 October 1917 and buried at Birr Cross Roads Cemetery at Zillebeke, Belgium. 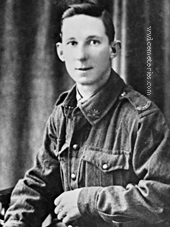 Driver Hanscombe's MM was awarded for bravery and devotion to duty, although heavily shocked, while delivering ammunition along the Menin Road whilst the column was being heavily shelled. Dvr Britten was the driver killed whilst delivering ammunition. 13th October 1917, aged 22. Son of David and Martha Coates; husband of Eva J. Coates, of Fletcher Rd., Peterhead, South Australia. A monumental worker from Yatala, South Australia, prior to enlistment, he embarked with the 7th Reinforcements from Adelaide on 27 June 1916 aboard HMAT Malakuta (A57) for Devonport, England. Following training in England he proceeded to France and joined his battalion on the Western Front near Dernancourt on 20 December 1916. 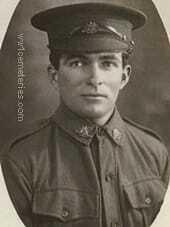 A week later he was attached to the ANZAC Light Railway for six months before rejoining his unit near Bapaume. Pte Coates was wounded in action near Zonnebeke, Belgium after being hit by an eighteen pounder shell which shattered his arm. He is believed to have been killed on the way to the Dressing Station. Son of G. E. and Mary Douglas, of 9, Bridge St., Erskineville, New South Wales. Born at Murrurundi, New South Wales. Three Douglas brothers (from left to right): 1800 Private (Pte) Kenneth George Douglas of Erskineville, NSW; 848 Lance Corporal (L Cpl) Alan Edward Douglas of Marrickville, NSW; 2879 Lance Sergeant (L Sgt) Gordon Leslie Douglas of Woollahra, NSW. A motor mechanic prior to enlistment, Pte Kenneth Douglas enlisted under the name George Douglass and embarked with the 2nd Reinforcements of the 35th Battalion from Sydney on HMAT Port Sydney on 4th September 1916. 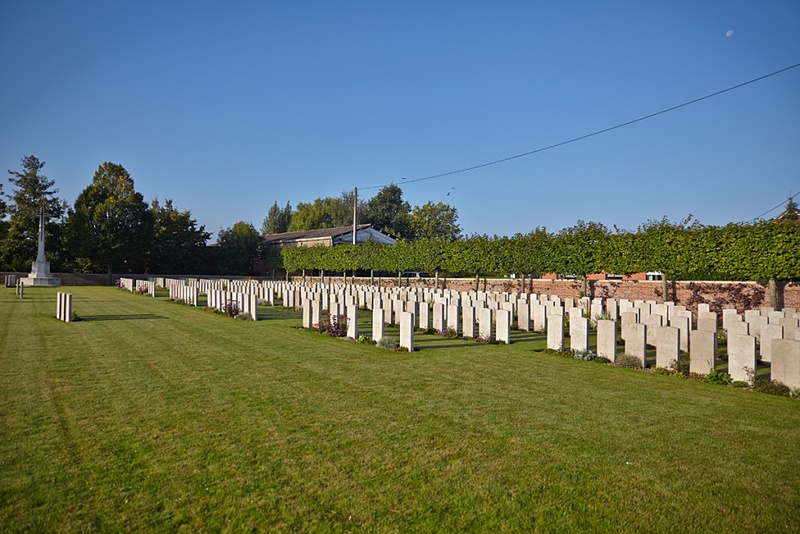 After transferring to the 17th Battalion, he was killed in action on 20th September 1917 and was buried in the Birr Cross Roads Cemetery, Belgium. L Cpl Alan Douglas was employed as a printer prior to enlistment and embarked from Sydney with C Company, 20th Battalion on HMAT Berrima on 25th June 1915. On 30th July 1916 he was killed in action and was buried in the Pozieres British Cemetery, Ovillers-La- Boisselle, France. L Sgt Gordon Douglas, a labourer prior to enlistment embarked as a Private (Pte) with the 6th Reinforcements, 17th Battalion, from Sydney on HMAT Euripides on 2nd November 1915. Later promoted to Lance Sergeant, he was killed in action in France on 15th April 1917. 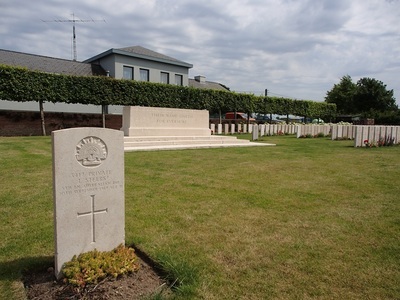 He was buried near where he fell but after the Armistice his grave could not be located and he is commemorated on the Villers-Bretonneux Memorial. "Douglas was killed by a shell near Ypres. 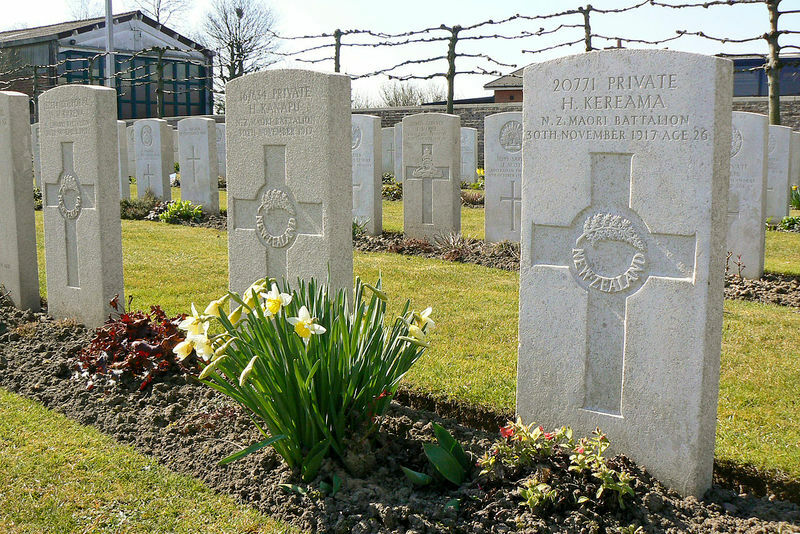 He was buried on the field on 20th September 1917, not in any cemetery. Death was intantaneous as his head and shoulders were blown off." 1st October 1917, aged 22. Son of Richard and Annie Glennon, of 16, Kingsley St., Camberwell, Victoria, Australia. Native of Carlton, Victoria. 26th September 1917, aged 31. Son of James and Elizabeth A. Heard; husband of Nellie Heard, of 716, Eastern Rd., Auburn, Victoria. Born at Collingwood, Victoria. 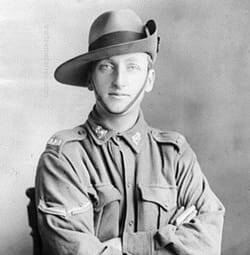 Prior to enlisting in the AIF on 15 July 1915 he served with the Citizens Military Forces. Pte Heard embarked from Melbourne aboard HMAT Warilda on 9 November 1915. He was later promoted to Company Quartermaster Sergeant (CQMS). 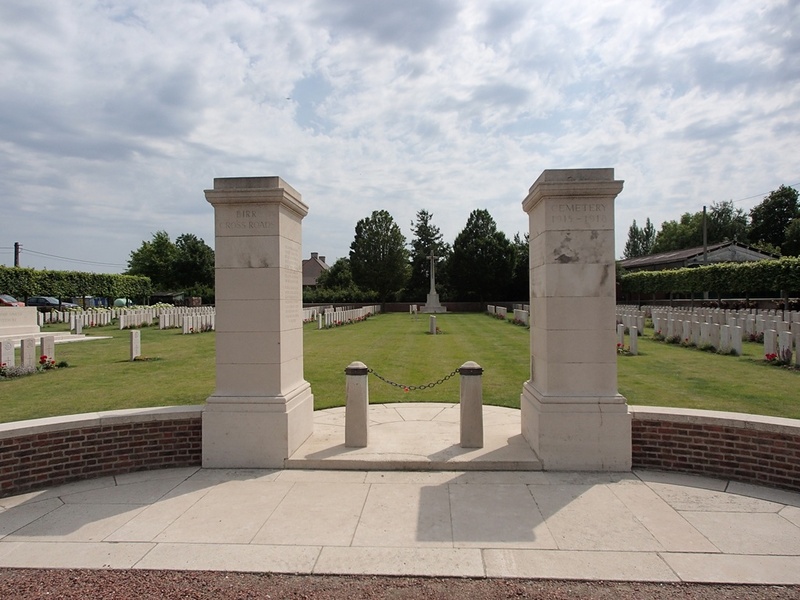 CQMS Heard was killed in action on 26 September 1917 at Polygon Wood, Belgium. 15th September 1917, aged 20. Son of Herbert R. and Janet R. Hoyle, of 141, Lime Avenue, Mildura, Victoria. Pte Hoyle enlisted on 19 July 1915 and embarked from Melbourne aboard HMAT Hawkes Bay on 26 October 1915. He was killed in action on 15 September 1917 on the Menin Road, Belgium, whilst serving with the 4th Field Artillery Brigade. 20th September 1917, aged 24. 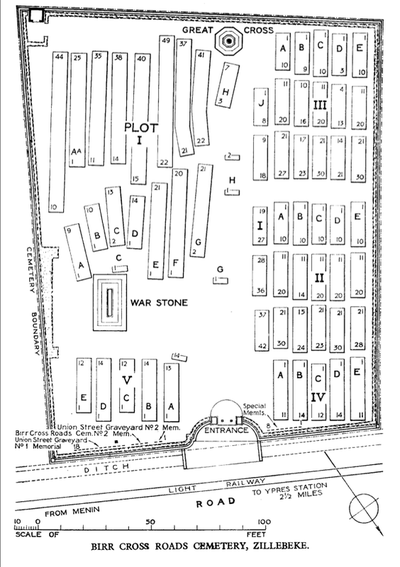 Joint Grave I. D. 19-20. Son of Charles James and Mima Huntsman, of "Nestor," corner of St. Kilda St. and Glyndon Avenue, Brighton, Victoria. Native of Coburg, Victoria. 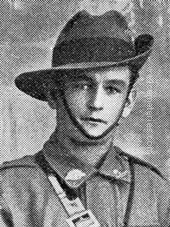 A 24 year old labourer prior to enlistment on 24 July 1916, he embarked for overseas with the 21st Reinforcements from Melbourne on 2 October 1916 aboard HMAT Nestor. He was killed by a shell at Polygon Wood, Belgium on 20 September 1917. Witnessess reported him killed by the concussion from the explosion and said that there was "not a mark on him." Son of Mr. A. Campbell Johnson; 1 husband of Elsie May Johnson, of 203, George St., East Melbourne, Victoria. Born at Glenelg, South Australia. 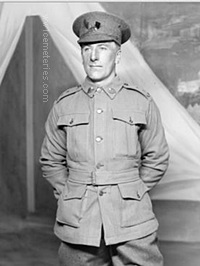 A clerk from Glenelg, South Australia, prior to enlistment with the 16th Reinforcements of the 10th Battalion, he attended the Military College Duntroon, and was commissioned on 10 May 1916. 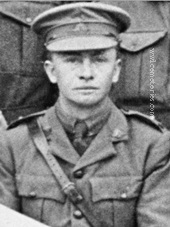 2nd Lt Johnson was then re-assigned to the 9th Reinforcements of the 32nd Battalion which embarked at Adelaide aboard HMAT Commonwealth on 21 September 1916 for Plymouth, England. Following training in England he joined his battalion in the field near Montauban, France, in late January 1917 and was promoted to Lieutenant on 10 June 1917. 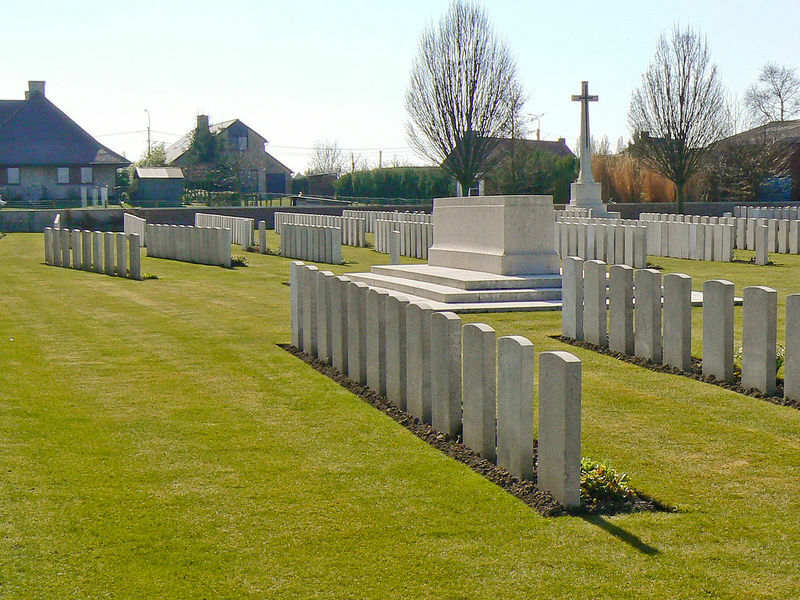 Lt Johnson was killed in action at Polygon Wood on 30 September 1917 and is interred in the Birr Cross Roads Cemetery, Belgium. He was aged 25 years. His older brother Captain James Alexander Campbell Johnson was killed in action near Bapaume, France, on 21 August 1918 after enlisting in The King's (Liverpool Regiment) in England in 1914. He is buried at the Railway Cutting Cemetery. 28th September 1917, aged 32. From St Kilda, Vic. A labourer prior to enlisting in August 1915, Pte Lomasney embarked from Melbourne with the 1st Reinforcements on board HMAT Ascanius (A11) on 10 November 1915. After arriving at Serapeum, Egypt in January 1916, the 29th Battalion became a part of the 5th Australian Division which proceeded to France in June 1916. 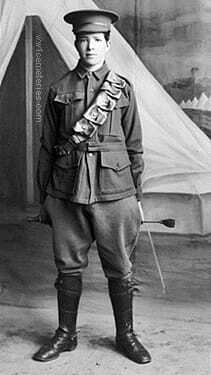 Pte Lomasney sustained a gun shot wound to the arm while in action at Fromelles during the first major battle of 19 to 20 July 1916. He was hospitalised in England until October 1916, and returned to his unit in France on 6 December 1916. On 28 September 1917, Pte Lomasney died of wounds received that same day at Polygon Wood. 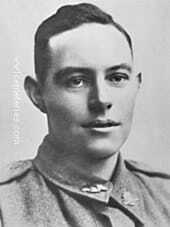 26th September 1917, aged 22. Son of the late Henry Alphonsus and Elizabeth Lilian Meads. Native of London, England. A labourer prior to enlisting, he embarked from Sydney aboard HMAT Ceramic (A40) on 7 October 1916. 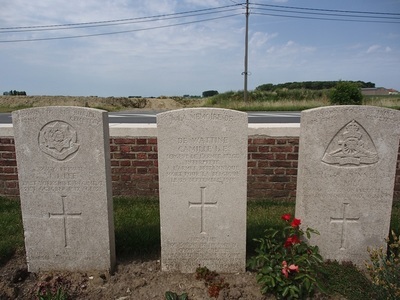 He was killed in action on 26 September 1917 at Polygon Wood, when hit in the neck by a shell splinter, he was said to have been buried originally just behind "The Mound at Polygon Wood." From Mincha, Vic. 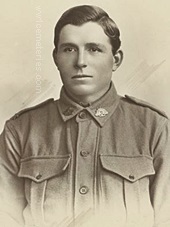 A farmer prior to enlisting in March 1916, Pte Ottrey embarked from Melbourne with the 4th Reinforcements aboard HMAT Orsova (A67) on 1 August 1916. He arrived in France for service on the Western Front on 7 December 1916. 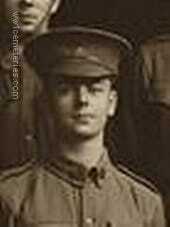 On 23 February 1917 Pte Ottrey was wounded in a grenade accident at Fricourt, France. Following treatment and recovery, he returned to his unit in April 1917. 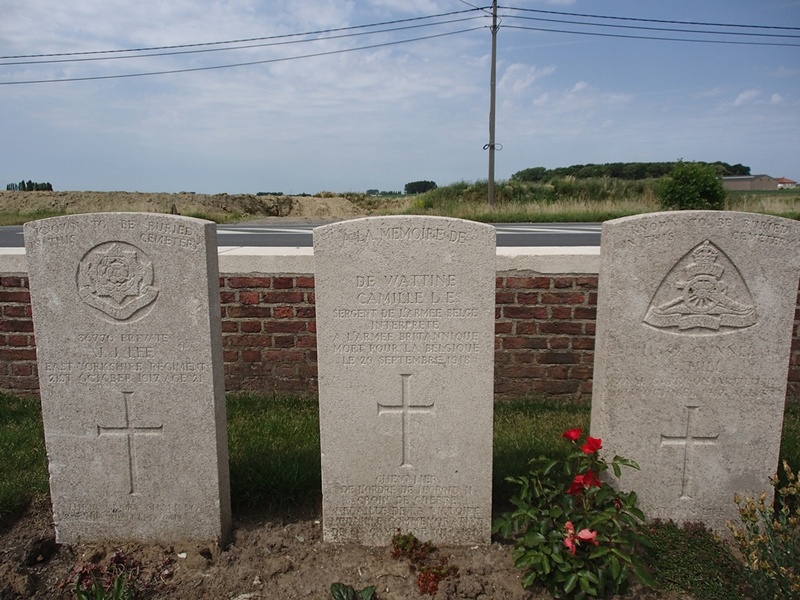 Pte Ottrey was killed in action in Belgium on 25 September 1917. He was 31 years of age. Pte Ottrey's brother 08/3030 Pte John Thomas Ottrey, 1st Battalion Otago Regiment, New Zealand Military Forces, was killed in action in France on 27 September 1916. He is commemorated on the Caterpillar Valley (New Zealand) Memorial. Son of Elizabeth Maurer (formerly Parish), of Berrico Creek, New South Wales, and the late William Charles Parish. ​A grocer from Berricoe Creek, NSW prior to enlistment, Pte Parish embarked with the 8th Reinforcements from Sydney on HMAT Suevic on 11 November 1916. On 26 September 1917 he was killed in action aged 20. Initially, he had no known grave however, in 1923 his remains were recovered and he was re-interred in the Birr Cross Roads Cemetery, Belgium. 20th September 1917, aged 31. Son of George and Ellen Peake, of "Braeside," Forest Rd., Peakhurst, New South Wales. A labourer prior to enlisting in March 1916, Pte Peake embarked from Sydney with the 15th Reinforcements on board HMAT Euripides (A14) on 9 September 1916. 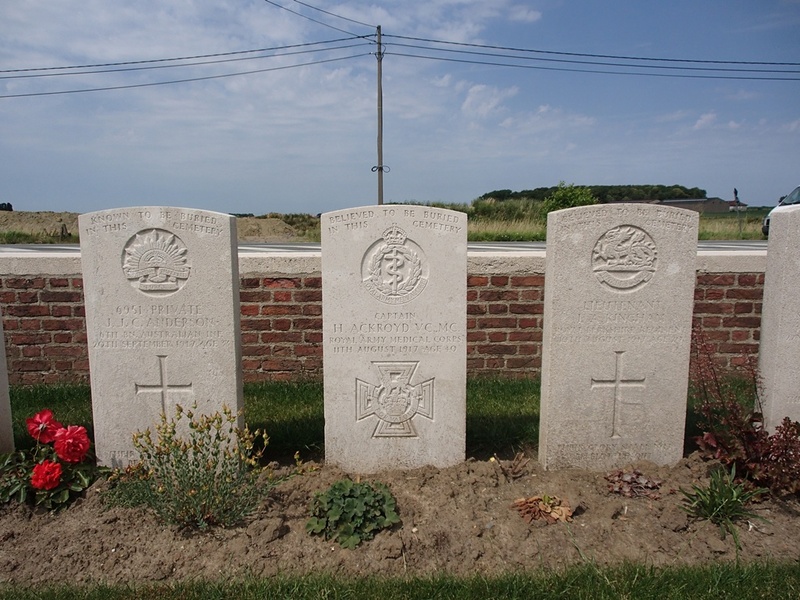 On 20 September 1917, Pte Peake was killed in action during the battle of the Menin Road. Walter Peake was amongst a group of men bringing up stretchers when a shell burst amongst them. He was badly wounded and put on a stretcher to be taken to the Dressing Station, on the way he was hit by another shell blast and killed. 25th September 1917, aged 19. Son of John and Isabella Robinson, of "Glendall," Prospect Terrace, South Brisbane. Queensland. From Gympie,Qld. A bank clerk prior to enlisting, he embarked from Sydney aboard HMAT Marathon (A74) on 10 May 1917. On 25 September 1917, aged 19, he was killed in action at Polygon Wood, Belgium. Son of Amy May Scragg, of "Fairview," Cumberland Rd., Auburn, New South Wales, and the late Arthur Scragg. Native of Waverley, New South Wales. 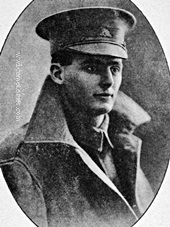 Ernest Albert Snashall, M. M.
18th September 1917, aged 29. Son of Alfred William and Susan Snashall, of 6, Fairmount St., Dulwich Hill, New South Wales. Native of Cape Town, South Africa. 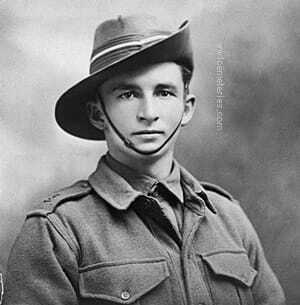 ​Killed in action near Zillebeke, Belgium and posthumously awarded the Military Medal. 4th September 1917, aged 22. Son of William and Emma Willis, of 202, Queen St., South Ashfield, New South Wales. Native of Lucknow, New South Wales. 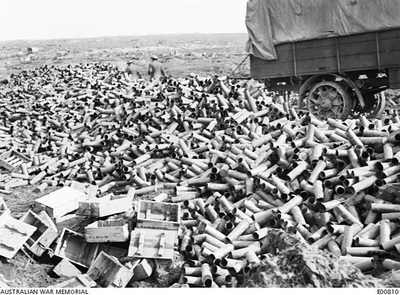 A baker and with service with the cadet corps in Nowra before enlisting in September 1915, Dvr Willis left Australia for England with the 13th Reinforcements in December 1915, and was transferred to the 14th (Howitzer) Field Artillery Brigade in April 1916. 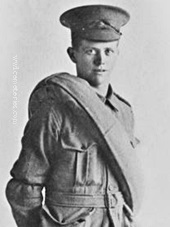 Arriving in France in January 1917 as a signaller for the brigade headquarters, Dvr Willis was killed by a shell which landed directly on top of the concrete dug out, causing it to collapse and crushing him and the six other signallers inside at Hell Fire Corner, Belgium. Son of Joseph and Jessie Willis, of High St., Cessnock, New South Wales. Native of Wollongon, New South Wales. From Cessnock, NSW. 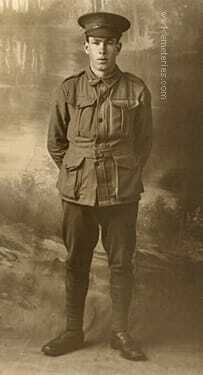 A 23 year old miner prior to enlisting on 7 August 1915, he embarked for overseas with the 15th Reinforcements of the 1st Battalion from Sydney on 8 March 1916 aboard HMAT Star of England. While undergoing further training in Egypt, he was transferred to the 53rd Battalion and then on arrival in France joined the 2nd Divisional Ammunition Column and then the 5th FAB. He was killed in action at Passchendaele, Belgium on 6 November 1917.